PEBBLE BEACH, Calif. – July 29, 2016 – Automotive Fine Arts Society (AFAS) member Tom Fritz will display his highly anticipated new automotive painting at the 2016 Pebble Beach Concours d’Elegance® on Sunday, Aug. 21, from 9:00 a.m. to 4:30 p.m., in beautiful Pebble Beach, California. 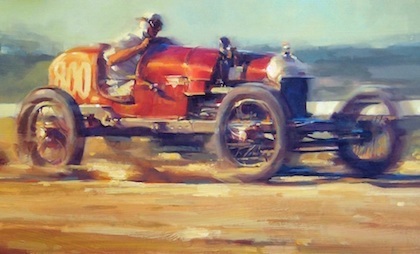 Fritz is known and admired for his dream-like paintings and realistic yet soft-toned approach to capturing the essence of exciting automobiles. Fritz’s painting entitled “Dishing It Out” is a stunning oil on panel featuring a beautiful red 1930’s Sprint car with the driver intensely fixated on the dirt path. Measuring 9” x 22”, this larger-than-life work is a tangible reproduction of a raw, unfiltered motor car kicking up dirt clouds as it speeds along the track. After earning his bachelor’s degree in two-dimensional art from California State University Northridge, Fritz worked with Fortune 500 defense firms including ITT, Litton Industries and Northrop Grumman for more than two decades. He has served clients such as Petersen Publishing and the United States Army and Air Force as a designer and illustrator, while accepting freelance commissions on his own time. Fritz is currently represented by the Sander’s Galleries in Tucson, Arizona, and Kustom Lane Gallery in Melbourne, Australia. His work can be found in many private and corporate collections around the world, including the Smithsonian Institution’s National Postal Museum, the corporate office of the AAA, the Wally Parks’ NHRA Museum, Pittsburgh Paint and Glass, General Motors, and the Ford Motor Company. His work has been reproduced in several internationally published magazines. Today, he paints out of his studio in Ventura County, California. He was commissioned to paint the portraits of Willie G. Davidson, and retired CEOs Richard Teerlink and Jeff Bleustein. Five of Tom’s works were chosen by the U.S. Postal Service for the Muscle Cars (Forever®) stamp series.